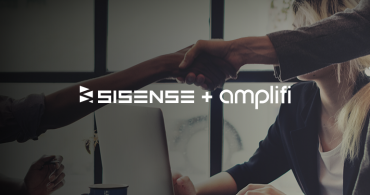 ORLANDO – MARCH 19, 2019 –Sisense, disrupting the BI market by simplifying business analytics for complex data, today announced a partnership with Amplifi, a best-in-class strategy and implementation consultancy for Information Management. In 2018 Amplifi saw more than 200 percent year-over-year revenue growth in its key business segments, and has a diverse client base that includes Ahold, Kellogg’s, GameStop, Floor & Decor, Oriental Trading, SC Johnson, Dal-Tile, and Scholastic, among many others. Amplifi helps enterprises increase business performance and maximize the value of their data by delivering top-rated strategy, solution design, and technology consulting. The partnership helps serve that market more effectively, pairing Amplifi’s expertise with Sisense’s ability to deliver actionable insights to business users, and empower the builders of analytical dashboards and apps at large enterprises. This partnership will allow both companies to leverage the power of insights and deep analysis early on in the process of data management, to ensure that enterprises have a solid data foundation, and leading, builder-centric tools to analyze it. Amplifi is a strategy and information management consultancy that helps the world’s leading brands, retailers, distributors, and manufacturers harness the power of their #1 asset…THEIR DATA. Amplifi provides best-in-class data consulting services that address the entire information value chain from strategy, solution definition, design and implementation of information management technologies and solutions. Consistently recognized as a leader by Gartner on the Market Guide for MDM External Service Providers report, Amplifi provides strategic consulting and implementation services for industry-leading B2B and B2C companies through its North American offices. To harness the power of your data, visit Amplifi at https://goamplifi.com. Sisense takes a radically different approach to business analytics. The company’s obsessive commitment to consistent product innovation and customer success enable organizations to instantly reveal insights from complex data. It’s BI for everyone, everywhere regardless of technical expertise. Sisense’s agility allows business users with no technical background to get the accurate intelligence at the very moment it is needed without waiting hours, days or even weeks for answers. Sisense provides a complete business platform to prepare, analyze and visualize large, volumes and varieties of data. Its unique In-Chip® and Single Stack® technologies simplify every step of the BI process – from data preparation to discovery of insights. From innovative startups to global brands like GE, Wix, Nasdaq and Philips, thousands of organizations worldwide embed Sisense in their everyday business to reveal instant insights.